Con artist and private eye China Smith works out of a bar in Singapore, roaming Asia in search of beautiful women (who like his tough style) and quick money. His nemeses are the friendly British Inspector and the scheming "empress." As I sat watching the DVD of the original "The Flight of the Phoenix", I was struck by seeing Dan Duryea. In my mind I kept seeing him in a white suit, on a black and white television screen. One of the joys of the IMDb is that one can find evidence of strange memories. We got our first television set in 1953; I was eight years old. 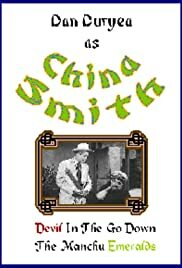 I did not recall until now but I watched "China Smith"! The memories from so long ago include Duryea's insouciance (a word I am sure I did not know in the early 1950s), the exotic locales and the beautiful women. Particularly the beautiful women. *sigh* There was an appeal to the anti-hero China Smith and though this series was hardly as influential, either generally or personally, as something like "Maverick", it still deserves to be remembered by a comment in the IMDb.